Since moving to the city in 2000 to study at the Art Institute of Atlanta, Russell has driven past the Varsity almost daily but never thought to stop in. Making desserts every night in high-end kitchens like Seeger’s and Nikolai’s Roof didn’t allow the Adairsville, Georgia, native much time for restaurant exploration. And even now that he works the day shift at Restaurant Eugene, his personal tastes more likely lead him to the homemade ramen noodles at Miso Izakaya or the Israeli shawarma at Pita Palace than to a classic Atlanta greasy spoon. 1. Make the applesauce: In a medium saucepan, bring the juice with cardamom pods and coffee beans to a boil. Remove from heat, cover, and let infuse for 5 minutes. Strain out the coffee and spices. Toss together the agar-agar or arrowroot with sugar and whisk into the hot liquid. Pour into a shallow pan and chill several hours or overnight. When firm, puree in a blender to a smooth sauce, adding a little fresh apple juice if it is too thick. 2. Make the pastries: In a medium bowl, combine the flour, butter, beaten egg, and salt. Knead together. Gather into a ball, place between two sheets of parchment paper, and roll out to a thickness of inch. Refrigerate one hour. 5. Chill until ready to serve, up to a day in advance. 6. Make the sherbet: In a medium saucepan, combine whole milk, powdered milk, sugar, and corn syrup. Gently heat over medium-low just until hot. Add zest and vanilla bean or extract. Let cool, then transfer to a container, cover, and refrigerate overnight. Remove from refrigerator; remove vanilla bean pod and strain out zest particles if desired. Transfer to the container of an ice cream maker. Add tangerine or orange juice. Churn according to manufacturer’s instructions. Transfer to a container and freeze at least 4 hours. Makes 5 cups. 7. 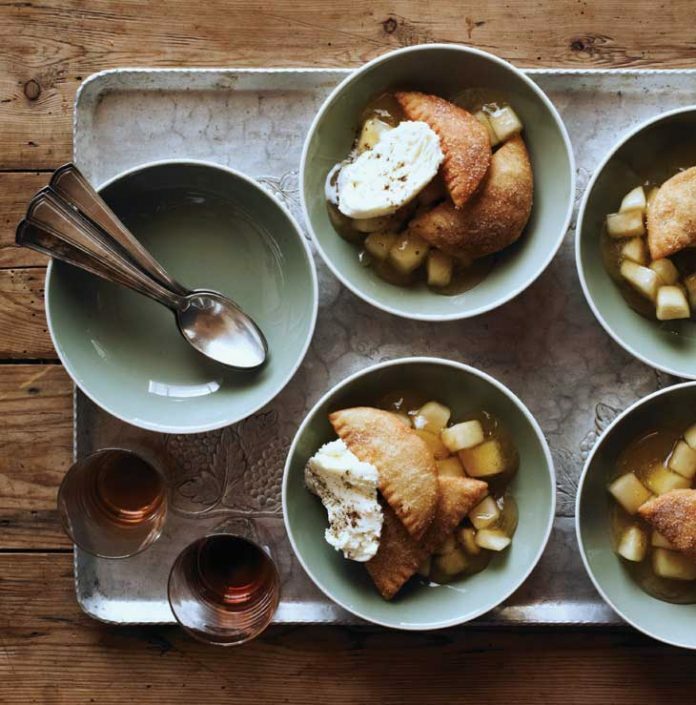 To plate: Divide compote among dessert plates or bowls, spoon applesauce over, and top with pastries. Finish each plate with a scoop of sherbet—garnished, if you like, with a pinch of ground coffee. This recipe originally appeared in our November 2012 issue.